There comes a point in our life that we would think about what would be the ideal toy we want for our kids. We know that what they play or spend their time at young age could actually determine how well their development would be. That is when we start to conduct our research about the best learning or educational toys for our kids and the most common answer we would probably get are train sets. A good example of a toy trains is the Melissa and Doug wooden train as its manufacturer have been long trying to innovate, design and develop healthy and educational play-set for quite some time now. Melissa & Doug is an American, privately owned company that manufactures children’s toy train since 1988. For over 2 and almost 3 decays now, they have continued to serve the young public needs for a supportive and educational recreation. They have come up with so many pieces of toy that makes leisure or plays time of your kids to be more purposeful as each and every set they create has its own way to discreetly educate your children. The company wants to implement the proper benefits of a toy and allow everyone to be able to avail the product without great expense. There are actually so many advantages, benefits, convenience, ease and comfort you could have in purchasing a wooden train set. Wooden train sets can think of to be blocks of wood, put together or carved to take the shape of the train. That same block of wood is hard and durable compared to plastic toys making it more practical as it sure to last longer. The wood is also non-toxic. Trains for kids made of wood do not create a lot of mess and very easy to pick up and store once your children are done playing. There are other more but the most important benefit would be that it helps in the development of children’s skill and brain stimulation. This is a 47 pieces train set, complete with a river bridge that swivels, storage house tunnel, train tracks, and figure accessories. The swiveling bridge is a feature that acts as an automatic traffic gate for the train. The set comes in one engine train car and 2 train cars with metals and magnets located at each end that allows it to connect with other train sets, fast and efficient. The wooden track size is average. There are 34 pieces of train tracks to connect and will require your children to do some basic assembling which can actually be a good training to improve hand-eye coordination and problem-solving skills. The set also promotes and imaginative and non-violent play-style. This simple product has good ratings given by customers who actually have purchased the set. It also has many positive reviews and feedback. The customers are entitled to their opinion and most of them gave the product high recommendations. The Melissa and Doug wooden train tracks have a variety of sizes. This product is on a larger scale. The tracks have several bridges and elevations, cross-loops and many imaginable routes. The set has a total of 130 plus pieces which mostly are made of natural wood. Each piece is created strongly and durable. It is guaranteed to last long and to be able to hold on to different play styles of a child. Most of the important pieces are detailed highly, covered in non-toxic paint and uses a variety of vibrant colors. It does have 6 pieces of freight and cargo train cars, 4 pieces of passenger car and three pieces flatbed cargo truck. It can accommodate several children all at once. The package includes a configuration manual with easy to follow visuals and instructions to imply an easy assembly. The previous 2 sets of trains are far more expensive compared to this one. 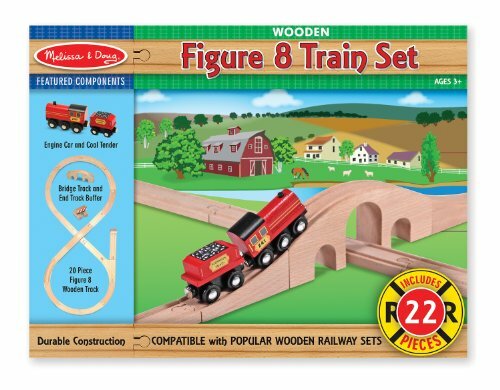 This is the Melissa & Doug wooden train set – figure 8. Having a tight budget and still wanting to afford a train set will definitely land you to this viable option. It does have a lesser number of pieces but it still maintains the quality of those higher priced Melissa and Doug wooden set. The training package includes 20 pieces of hard and durable wooden train pieces and simple train tracks that form an 8 figure. The train cars and the tracks are highly compatible with other forms of wooden train sets, especially those that are listed on the most popular brands like the Brio or Thomas and Friends wooden set. You can have the train cars used as an accessory or replacement car due to its perfect fit on standard size wooden tracks. 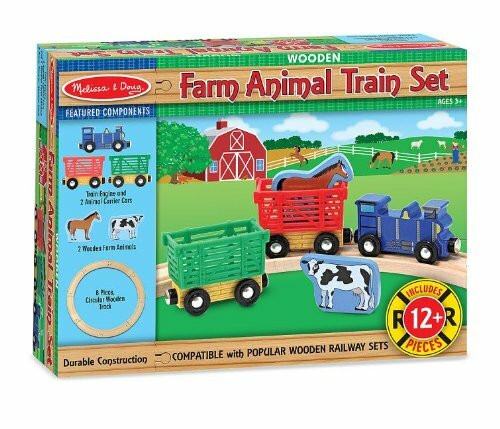 Another great affordable set which is intended for kids with ages 3 years old and up is the Animal Farm train wooden set from Melissa & Doug. It features a farm animal, a horse and a cow, which can be loaded up to the back of the train car. The set includes 3 pieces of the train car, an engine car, and 2 animal cargo cars. The tracks are 8 pieces made from strong wood with a standard size and an easy lock mechanism. The track forms a simple circle to where your child can push the train around. It uses a unique magnetic coupling system that allows you to use and connect the train cars with ease and comfort. You can actually connect this train cars to your child’s existing train set provided that they use the same coupling. This is a classical Melissa Doug wooden train set that conceptualized from blocks. It is an affordable educational and fun train set with three pieces of interchangeable cars and a train engine car. The train car can carry on its back, a cow wooden figure, 2 pieces of fresh bottled cow milk, a crate of fruits and vegetables. All parts and pieces of the classic wooden toy are made of really hard and durable wood, painted with non-toxic materials and built to last. Although fun and exciting, you might actually want to have an adult supervision as your kid play with the set because some of the pieces are small and could actually be a choke-hazard material. This set, in general, greatly provides imaginative role-playing as your children vividly imagine a train farm environment. It may come close in appearance with the Classical Wooden farm set but this one features zoo animals instead of farm animals. There is a wooden tiger and elephant figure included which your kids could easily load up the back of the train animal cargo car. Allow your child to be more creative and have their imaginative journey to the zoo as they transport and deliver the animals through trains. It includes a basic circle wooden train tracks comprised of 8 pieces. 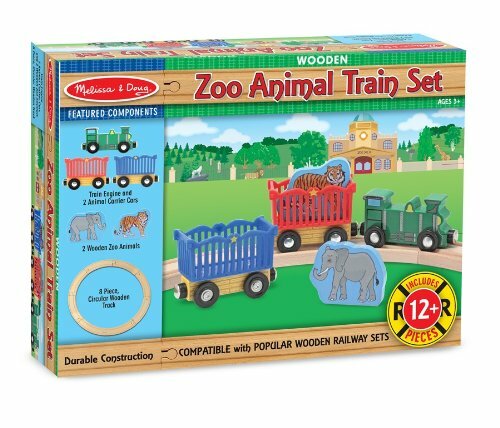 This zoo animal set is actually compatible to run and be connected with the wooden farm set and other wooden train track system of popular manufacturer or brands. This is recommended for children’s learning provided they are 3 years old or higher. This is a mountain tunnel train wooden set that features a mountain board to which train tracks and your child’s train passes through, brought and made for your kids by Melissa & Doug. The tracks are designed and laid out uniquely to have a leveraged amount of fun. There is an elevation on one side which is built with great construction and does not tend to derail your child’s train. The set includes 3 pieces of train mining cars to give your kid a better idea of a great imaginative mining environment. The product usually takes to about 3 weeks to ship. If you plan on purchasing, it is advised that you order as earlier to keep up with your schedule. It also has an average cost but could be compensated by the durability of the set. The train set package is highly durable, making it a more practical investment for an educational train toy. Surprisingly, Melissa and Doug also made stacking blocks train to accommodate children starting at 2 years old. 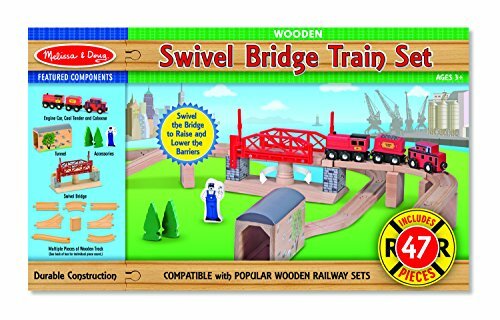 The Melissa and Doug wooden stacking train are made of blocks that are large and is not at all, choke hazard to younger kids with their swallowing reflexes. The set will send your kids to be more imaginative as they stack each block to form a train. This is guaranteed to greatly improve their logical, reasoning, hand-eye coordination and problem-solving skills as most wooden blocks toys do. This will also help them to practice color and shape identification that could prepare them once they get to a proper age of school. Each block is strong and durable enough to surpass a heavy beating or rough toddler’s play style. For a short and small amount of price, this is a great learning kit investment for your kids. 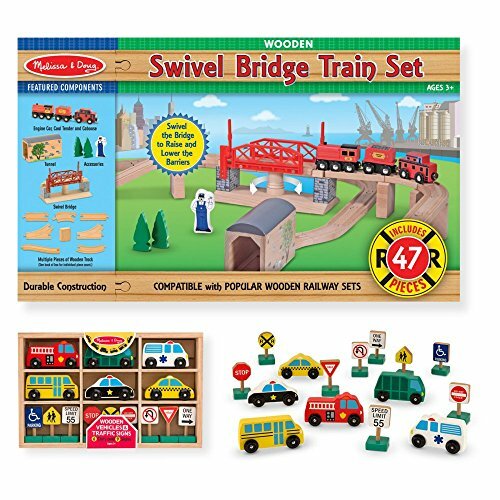 This is a 2 bundle Melissa Doug wooden train, one is that of the previous item in the list, the swivel bridge wooden train and the other includes a collection of city cars and signs. The goal of these two products being in one package is to enable your children to have a complete city train experience and provide more imaginative play. Your kids can work out on what layout they want as there are many accessories available for them. Both set in the bundle is made of sturdy hard natural wood and some parts from non-toxic, kid-friendly, hard plastic. The bundle is of a reasonable price which can be attained easily and light on your pocket. The train tracks of the swivel bridge wooden set measure to about 11.7 inches in length by 8.5 inches in width by 1.6 inches in height. The bridge really does swivels as the train crosses. It is remarkable fun to look at as it does add more movement and train layout option for your kids. 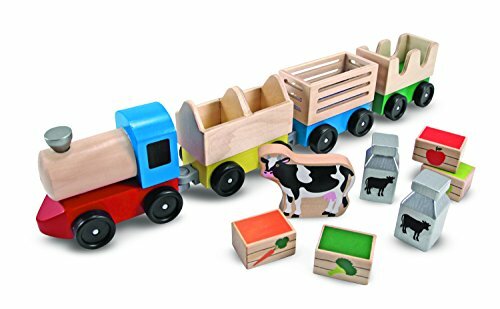 The same with the previous Melissa and Doug wooden farm train, this is a special packed set that comes with a free board-book titled, “A Day on the Farm”. There are only a few of this special bundled pack available. You might be able to buy a farm set with no board-book but it doesn’t work the other way. If you plan to give your child that well-illustrated and beautifully detailed board-book, you need to purchase this package. The train set and accessories included are painted brightly and colorful using non-toxic paint and drawing materials. It has exceptional quality and durability. The design is derived for a block toy concept and innovated to this amazing wooden train toy set. You can have the board-book and the toy, bundled in a low and affordable price. There are only a few of this amazing Melissa & Doug wooden train cars set left in the market and you would not want to miss out on a great chance of availing the product as it is very light and easy on your budget. The set includes a total of 7 pieces of train passenger car and passenger figures. This train passenger toy could actually work great to be an additional train car for your children’s existing wooden set or could be a decorative set and provide more imaginative play as they have an additional set to think about for their wanted train theme layout. 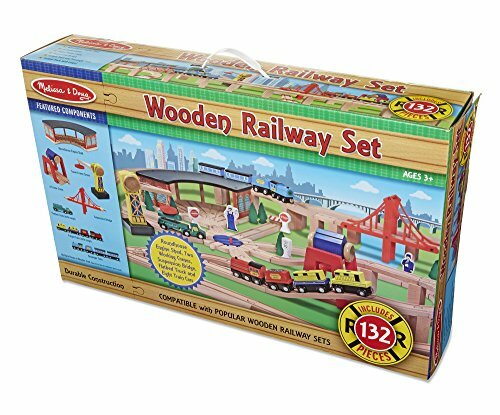 As you have seen before, Melissa and Doug wooden farm train is great for kids at a younger age, how much more if that train set comes in a limited bundle with a train engineer costume? That would trigger a more creative play and would expand your children’s imagination. It could actually implement a healthy and inspiring role-playing environment where your kids are trying to picture their selves to be an engineer. There are only a few stocks left for this bundle. Try to grab your kids their bundle and watch them have loads of fun and laughter as they learn. 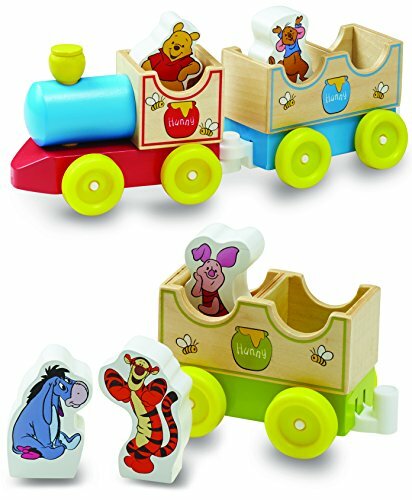 This Melissa and Doug wooden train set features our children’s beloved Disney characters from the favorite cartoon, Winnie the Pooh. The set includes 3 train cars where Pooh is the train driver/conductor and tagging along the train cars for a wonderful ride would be Tigger and some of their friends. The idea here is to combine the favorite cartoon characters and the love of train, all into one set. The product is actually very catchy. There have been tons of purchases made and customers have always given good rates and product reviews. You can have this wonderful kid’s educational toy for a great and easy price. This is another Melissa and Doug wooden stacking train. It is much taller than the previous block stacking set and only has 2 wooden cars to hold up the stacks. 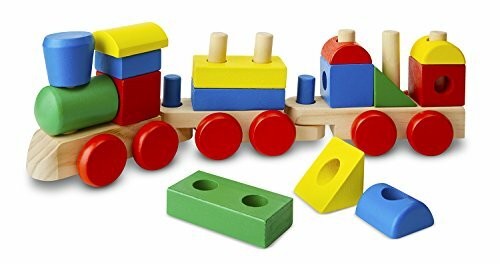 Your children will have a great time stacking different shaped blocks to form the train. It will discreetly enhance their color and shape identification skills with minimal adult supervision as they learn. Each piece is large enough to be a choke-hazard free toy for younger kids. 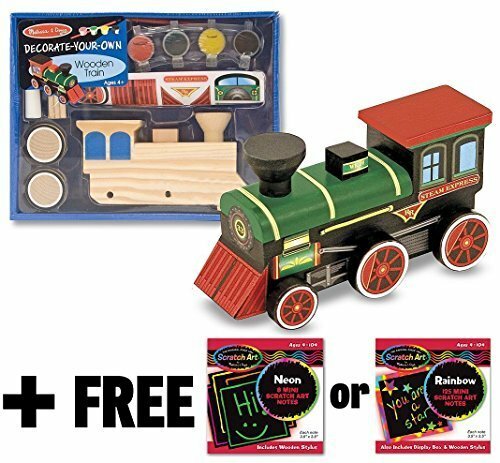 The decorate-your-own wooden train toy from Melissa and Doug will bring out the artistic side of your child. 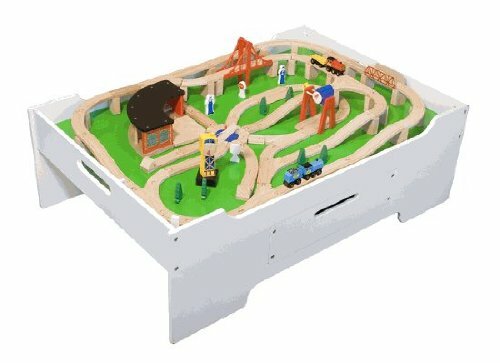 This is an actual wooden train toy with plain design and layout. It includes coloring materials to where you children can have a great time trying to apply what their imagination ought to look like in a train. After a great artistic finish, children can play with the strong and sturdy wooden train and let them run on tracks. The coloring, decorate your own wooden train set is advised only for children aging 4 years old and higher. Children playing with the set require their parents to spend some time or provide them with adult supervision as painting can get messy and for a proper play style. This is a passenger toy car from Melissa and Doug. It could work as an ordinary train toy but the intent of this highly detailed product is to be connected with other train sets. It is a replacement or additional train passenger car for some parents who needed to replace or extend their children’s wooden play set. There are metal and magnets installed at the end of the passenger car to be able to connect it through most wooden train set. The single piece of a toy is for a great price and with remarkable sturdiness. It is made from the United States and there are only a few of this left so grab your piece at the soonest time. For a very, very low price that would cost you only a few bucks, don’t miss the chance to add this toy to your children’s collection of train cars. It can easily go along with different train design, layout or concept. 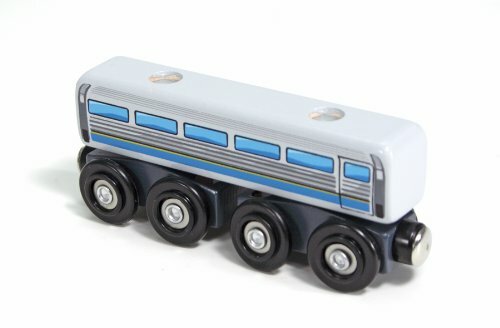 This train toy can connect efficiently with other wooden train cars due to its magnetic coupling system installed at end to end. There are only few stocks left of this elegant looking train car. This is a decorate-your-own twin pack. It is a bundle where one pack allows your children to handle train coloring and the other is that of a plane. Your kids are required to brush the vehicular shaped wood blocks first with colors before they can be able to appreciate playing with the toy. This will simulate their mind into opening up to a new idea, imagination or creativity. The set is not at all expensive. It is a practical purchase for those parents who want to implement an educational or learning toy set as their kids grow and develop. Saving the best for last, this one here is an example of a complete set of wooden train table with a wooden train set from Melissa & Doug. This example of a train toy set is only few of the main train set with train tables being sold by the manufacturer. It saves you the trouble of looking for individual pieces of train cars, tracks, figures or infrastructure as it is all included in this train toy package. The table offers a drawer to where you can easily store all the train parts and accessories right after your children’s play. You can also have this table laid out if your children need some space to work with their homework or other learning activities. Train sets or toys are not only loved by children in terms of fun and entertainment. There are adult train lovers who love trains and spend most of their spare time doing train activities with their friends or their kids. It is a great way for them to bond young members of their family and works great as a stress reliever. Adult train lovers, however, tend to purchase expensive sets with design and aesthetics more appropriate for their age. Something filled with features such as enabling the user to control the train’s movement and sound remotely, electric powered that needs to be plugged, smoke-puffing unit, all of which are irrelevant and dangerous for a child. Given that the intent of your train purchase are for kids and not for an adult train lover use, then you can opt for a Melissa and Doug wooden train set as it is probably the best choice for your preference. You can resort to a more expensive train set if you are not satisfied with the above list but would you spent so much for something with great features still gives the same amount of educational benefits for your kids? Some of Melissa & Doug’s train set has above average price but it is still highly affordable and easy on your wallet. It can give your children the assistance and aid in their childhood development and prepare them for a better future, all for something that is within your budget line.